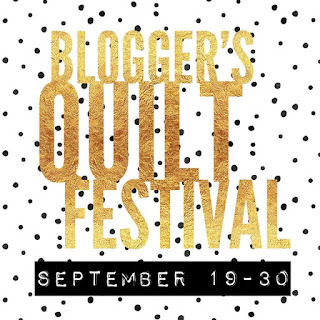 Three cheers for the Blogger's Quilt Festival once again gracing our screens! It gives us an opportunity to share quilts again that we're extra proud of (and I'll actually introduce one of my newest finishes this week as part of the festival!). 1. Colors. I started with 2.5" mini charm squares of Carolyn Friedlander's Doe fabric, and pulled colors that are quite unlike my normal color schemes. 2. Layout. As the quilt evolved, it became clear that I didn't want a neutral in the background (why go neutral when you can go full on COLOR?). 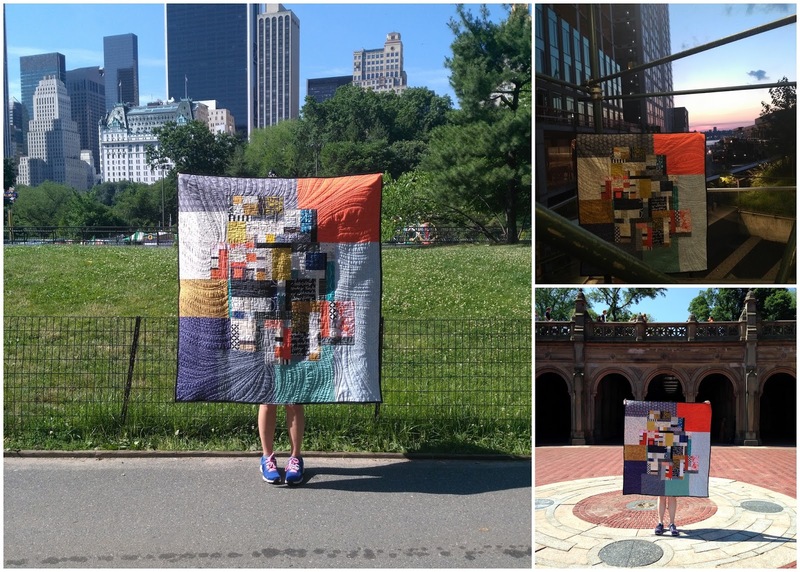 Forget gray and white - this quilt totally transformed. 3. Piecing. The middle is completely pieced; this was not easy to do but I am so proud of it! "Metropolis" was the first time I really used partial seams, and now I don't hesitate to use them when needed. Learning new skills is always a plus. 4. Quilting. Notice how I didn't say "the quilting process" - because that was the main part I struggled with over about a year! With help and encouragement from lecture attendees and students, I started to see a "city" in the middle of the quilt, and quilted it at varying densities to encapsulate the idea of population density. One day, I finally decided to quilt the "background" with improv-y, wavy lines. I am so glad I did. 5. Photoshoot. 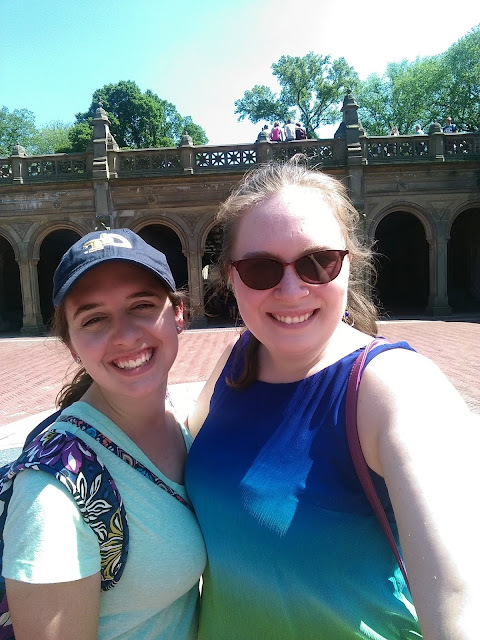 I have fond memories of traipsing around New York City with my sister this summer. We took some great shots and got lots of strange looks - but it was sooo worth it. Long ago were the days when we were embarrassed to whip out quilts in public. Please enjoy the festival, which has many categories of quilts! Make sure you vote for Viewer's Choice as well! Thank you to Amy for hosting and to the festival sponsors for supporting such a wonderful show (and the blogging community). It is a beautiful quilt. One to be very proud of. It is such a great feeling when you step outside of your comfort zone and things go so well. Great job! What a gorgeous quilt to enter! It's turned out beautifully and I like what you say about learning new skills - once you have them mastered you look at things so differently. I've not got round to partial seams but am in the process of conquering curves! This is one of my favorites of your quilts. Another favorite is an early orange peel (?) quilt with a neutral background and colorful (purple and others) peels. Oh! Nice one - love all of the prints in here! Amazing quilt! I love the "why go neutral when you can go full on color" part! haha! Very you! Beautiful quilting Jess, you should definitely be proud! xo. Great, great quilt, my favorite of yours so far! I couldn't find your email address, so I'm replying here. Hopefully you see it! Such a fantastic quilt! The 'chunks' of the suburb fabrics surrounding the downtown are just perfect! Great entry for the BQF! It's a wonderful quilt Jess. I really like it. Awesome! Love the improv style design. Your quilting choice works really well, too! This is a beautiful quilt. I love it!! This quilt is so amazing! I really love the design idea and execution. Your work is inspiring. So fun you could photograph it in NYC too! Congratulations on being a finalist in the festival. This quilt may be my favorite of yours. I think it's the palette that initially gets me ... Those mustardy-browns could fall flat in another quilt, but here they counter the cool blues with a needed warmth. And it's the contrast between the small scale of the center pieces and the large-scale outer pieces, giving the illusion that the center is almost emerging from the background. Well done!